“What was it like? That first moment you set foot on the ground again?” Many people have asked me this over the past few weeks, since ending my 449 day tree sit on March 7th. And to be honest, I can’t remember. 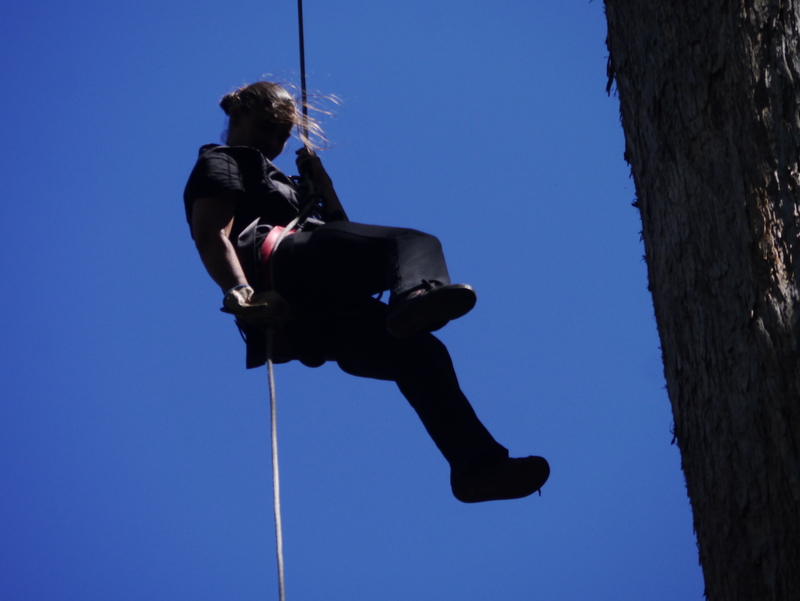 I can’t remember what was going through my mind as I made that quiet descent – twirling around as the rope spun, watching the forest floor slowly get closer and closer. You know those times when there are so many thoughts that could be going through your mind, so many emotions- and because there are just too many your mind is instead quiet and uncannily empty? Strangely, one thing I do remember is the smell! As soon as I entered the understorey I was fully immersed in the scent of celery top pines- after almost a year and a half living in a cloud of eucalyptus. It smelt beautiful!! When I set foot on the ground I clung to my rope like it would save my life. I didn’t want to let you. I descended into a media scrum. Despite how absolutely lovely and understanding they all were, it still felt a little like getting out of the tree to a pack of wolves waiting at the bottom- it was the biggest group of people I had seen at once in a very long time! The smiling face of Bob Brown welcomed me to the ground. And a hug from Jenny Weber nearly brought me to tears- after all this time working so closely together on the forest campaign, but at a distance it was so nice to see her face to face once again. I looked around me, apologetic faces of photographers looked back, as they snapped away at their cameras while knowing how strange it all must feel for me. I gave a smile and gripped the rope tighter. “You can get out of your harness now!” Someone suggested. “uh..uh” I shook my head and kept my fingers firmly in place on the rope that had been my life-line for all those months. I did my media interview like this and still didn’t let go after the media left and the forest fell quiet. That rope was the thing that physically connected me to the tree for over a year. I didn’t want to let go- of the rope, or of my tree. Hours passed, as my support crew walked back and forth up the hill, packing up camp and taking my things to the car. I stayed at the base of the tree, connected to the rope. My last goodbye. Eventually I slowly undid my prussiks from the climb line and took a step back. The rope dangled in the air. I took a deep breath and stepped away from the tree for the first time in over 14 months. I turned around and looked into the forest around me. And without looking back, I disappeared in the undergrowth of ferns. I was shocked by my own agility. Each foot taking one step after another, over rocky ground and tree roots, the ground below me moving up and down as I crossed the steep terrain. I couldn’t believe it! I guess I owe a big thank you to the wonderful support crew who sent me up that stepping machine last winter. The daily exercises paid off and I was taking to the land like I’d never left! Great- one less hurdle to worry about. And i was relieved to do without the embarrassment of falling flat on my face like I’d envisaged. Now that I was getting the hang of this walking thing, I started to look around me at the forest understorey. All those months I had come to know the forest so intimately, yet I had known it from only one perspective. 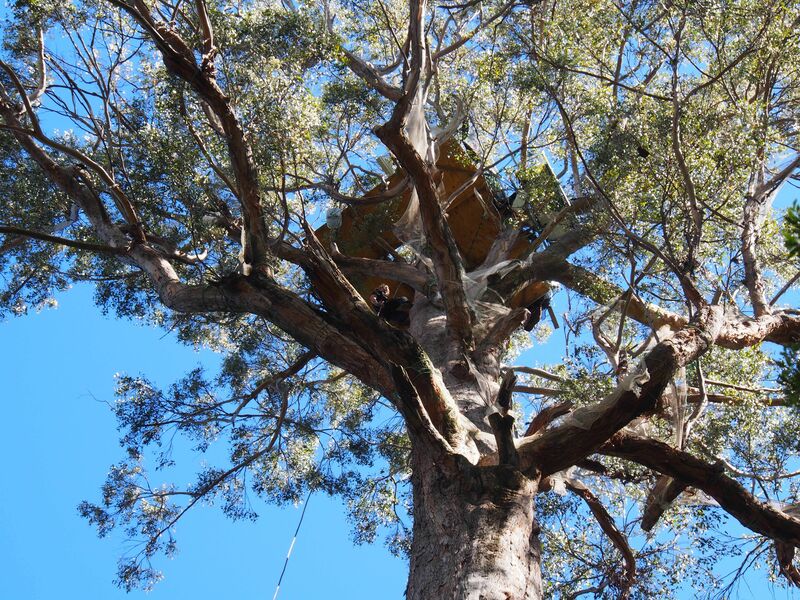 The upper canopy is dominated by the giant eucalypts that tower above the forest floor. Down below it was a whole other world. 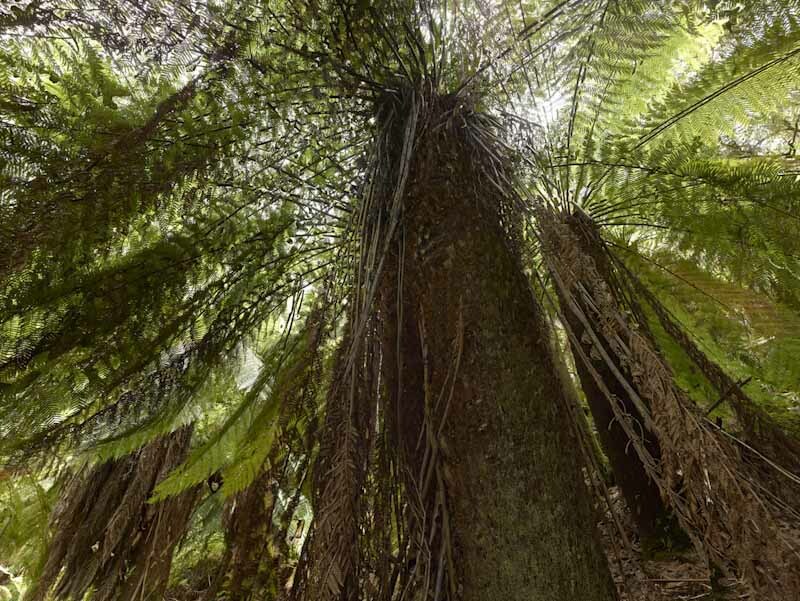 I marveled at the tree ferns, growing much taller than me despite only progressing approximately 1-2 cm per year. I watched small wrens dart about on the ground and then disappear into a thicket of ferns. I saw a small animal, maybe an antechinus, scamper across the leaf litter and dive into a burrow between tree roots. I sat down on the ground, springy with brown leaves, twigs and a coating of moss. I looked up into the green canopy of sassafras leaves closing in above the forest. As much as I was already missing my tree top home, I felt a renewed appreciation for the beauty of the forest on ground level. I returned to the tree and stood beside a bundle of rope that had been thrown onto a log protruding at a 45 degree angle from the ground. Perhaps this log had once been a limb of my tree and long ago plunged violently into the earth. Now it acted as a great bench right beside the tree. The rope draped across it’s rotting flesh triggered a memory. Like dejavu I instantly relived the last moments I had been here in this place. So strange that I had been right here with this tree for so long, but the last time I stood by it’s base was mid-December 2011. I reminisced about the what it had been like. 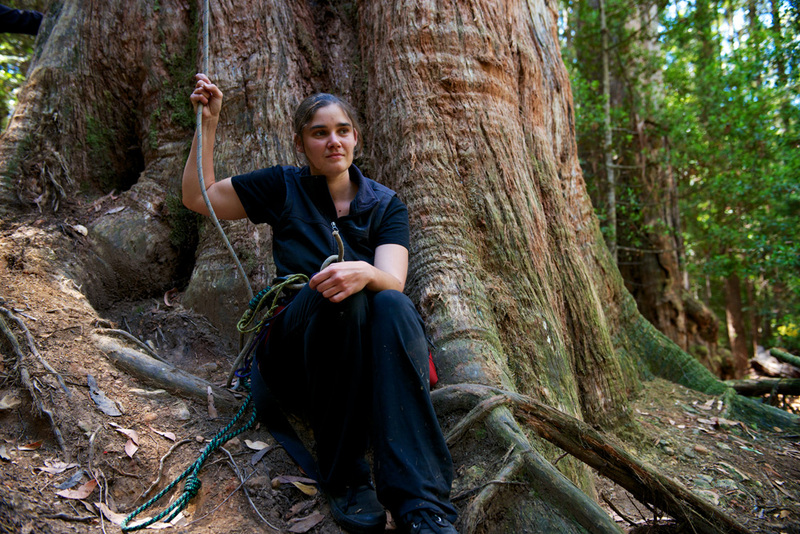 The forest had been a hive of activity, climbing ropes and polypropylene ropes coiled and bundled around us. Planks of wood in an assortment of sizes carefully marked and labeled so we would able to fit the pieces of the puzzle together again up in the tree. I tried to remember how I’d felt then… anxious and excited. Full of anticipated mingled with trepidation at the uncertainty of what I had decided to embark on. Now, as those same ropes were once more coiled and bundled and walked back down the hill towards the car, it was the end of an incredible journey for me. A journey that those days of preparation and anticipation could never have prepared me for. A journey into the forest, into this ecosystem, into this campaign and into myself… in a way I could never have imagined back then. Someone walked past me carrying a box of food “Geez, hard to believe all this stuff could fit on that tiny platform!” I followed their gaze up into the branches of my tree. It was strange to look at the pattern of these branches in reverse. From 60 meters away the platform circling the trunk right at the crown of the tree certainly did look tiny. But it had come to feel so spacious to me. There was all the space I needed. To walk around (3 steps one way and back the other, that is), to sleep, eat, bathe, watch the sunrise and talk to thousands of people around the world. It was all the space I needed. And sometimes it felt luxuriously large. At other times I felt like tearing my hair out at being confined on a 3×3 meter platform. Now, as I stood looking up, I had the whole world at my feet, but all I wanted to do was jump on that climb line again and go back up to that little platform that I call home. I resisted the urge, despite the growing anxiety about what now lay before me. I tried not to think about life beyond the forest, it was all too overwhelming. Lying down with my head on the trees roots like a pillow I looked into the upper canopy of my tree, to branches I had watched every day for over 400 days. My anxiety was immediately comforted by the familiar movement of them as they danced against the blue sky. Although the leaves were now tiny specs from this great distance, they were the very same leaves that I knew so well. And it was like this, the weight of my head nestled against the base of the tree, that I said my final goodbye. Over the past few weeks I’ve tried many times to write a blog to let you know what this has been like- getting down, adjusting to the world on the ground. But every time I sit down to write i don’t know what to say. It is so overwhelming- everything that has taken place and all I have thought and felt these past few months- it felt impossible to know where to start. Today I have told you the story of my feet touching the ground again, but now that I’ve started writing there are so many more stories that want to come tumbling out: of the fire, my last day in the tree, my first day in a house! So stay tuned… Keep checking this blog and in the meantime, don’t forget to take action to help protect these forests… CLICK HERE. Posted on March 29, 2013, in Daily Blog. Bookmark the permalink. 14 Comments. .. and now, to all her other wonderful attributes, Miranda adds magnificent writing! Thank you for writing these words for us all, I find them very touching, I am so glad you had time to say good-bye to your tree, although it is not really good-bye, I’m sure you will visit it again. It’s good to know that you were able to walk out comfortably, I did wonder if this would be the case. I love your description of your first moments on the earth again, of the forgotten yet heightened sense of smell and sight of the understory of the forest trees, I look forward to more of your writing, wishing you all the very best. Thank you for your amazing courage sharing this with us. It must have been incredibly hard to leave your friend, the tree, and your home, the tree. No wonder you could not detach from the cord – it would be like removing your life line symbolically an umbilical cord attaching you to your mother, the tree. I wonder how you are managing to sleep without the sound of the leaves and the wind, and the gentle rocking? I look forward to hearing more of your story. The tree is probably missing you as much as you miss it. Do you plan to go back and visit? So I’ll show her. I’ll find ways to support our native forests. They’ll probably be humble, but ‘from each according to his ability…’ Is imitation the sincerest form of flattery? Maybe, but, I’m not thinking of going up the O. Tree. If I can find ways that work for me, I’ll do them. * care for: a bit of a ‘loose’ translation of ‘cultiver’. Thankyou for being so brave. The planet appreciates your efforts. Thank you for sharing that. No one can take away what you did. All the best. Hi Miranda, I was just watching a U.Tube video on the fight for the Kimberley, and I thought of you miles away from the red dust of the Kimberley, but fighting for the green forests of Tasmania, and beyond, how sad that these protests have to happen all over the place, lets hope both these places that are so incredibly special win their battles to survive. Thanks for keeping up the fight for the future.